There's something to be said about the power of simplicity. Some of the best experiences to be had in gaming are compelling not because of their depth or complexity, but because of how they offer a distilled example of an excellent gameplay concept. Nintendo has seemingly adapted this approach in many of its current generation takes on older game franchises, exchanging innovation for rock solid and relatively stripped back experiences that are made simply to be fun; no more, no less. Blocky Bot is an example of a game that follows this template quite well, opting to deliver a basic yet engaging product. The premise of Blocky Bot is quite simple. Resembling something rather like the Squid Jump mini game from Splatoon, players must guide Blocky Bot (or one of the dozens of unlockable characters) by jumping up an endless series of platforms to escape a cloud of darkness constantly advancing from the bottom of the screen. Some of the platforms will have an enemy pacing along its width and some will be moving back and forth, throwing in just enough variety to keep things interesting and prevent the gameplay from becoming overly repetitive. It's easy to get into and rather difficult to put down, as the fast paced nature of the gameplay properly nails that "one more try" feeling. If you miss a platform or an enemy gets you, a quick death animation plays and you almost seamlessly start again from the bottom, with a few visible platforms tempting you to come and have another go. Controls are pleasantly tight and responsive, meaning that the majority of mistakes feel more like the player's fault than the game mechanics, while the frame rate maintains a buttery smooth pace. 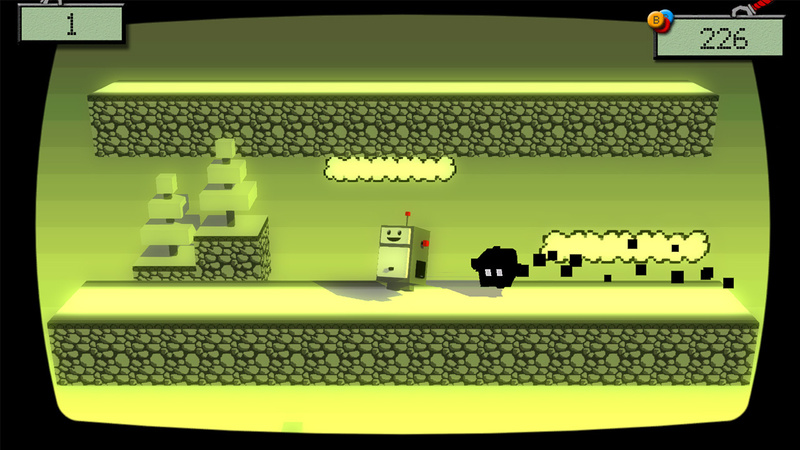 The blocky, neo-retro visuals make it easy to distinguish obstacles as they're approached and also give the game a chipper and charming atmosphere. All of this is accompanied by an upbeat chiptune track that doesn't get on one's nerves too much, though this being the only track may lead some to hit the mute button after an extended play session. Off-TV play is fully featured here as well, with a simple tap of the minus button toggling between the main TV or the GamePad screen. Though this is primarily a score based game - with the objective being to see how many platforms can be jumped before death - there's a light replayability element to it. After meeting certain requirements a few level themes can be unlocked that portray the world in a different style, such as a theme that gives the appearance of the monochromatic, pea-green Game Boy screen and adds more 8-bit sounds to the main track. In addition, boxes collected on the way up will grant players credits, one hundred of which will randomly unlock another playable character. There's no difference in how these characters behave, but it nonetheless gives a decent sense of progression. 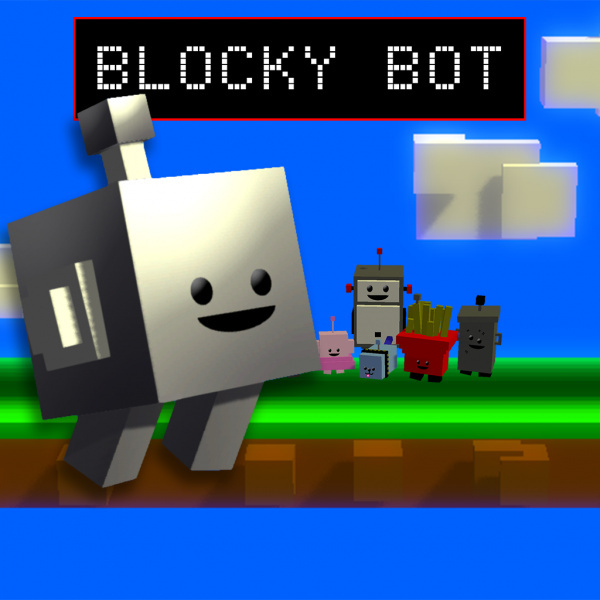 Blocky Bot is a fun little time waster that'll have you coming back again and again. The decidedly simple presentation and gameplay are a better fit for quick bursts of play and this may turn off some, but this is a surprisingly gripping arcade platformer. Chipper visuals, rapid fire gameplay and some light replayability make this a solid recommendation for those just looking for a mindless and easy to pick up experience. Hoping this comes to Europe. In all honesty, I really don't like Nintendo's modern approach to gaming. It's... too simple, like what the article says. Simplicity just doesn't engage me. I've actually sold a lot of Nintendo games on my Wii U for this reason, and I hate selling games. @Kirby_Fan_DL3 There's certainly pros and cons to it. Personally, I've been quite pleased with their work over the past few years, though I do think it's time they take a much needed kick in the pants and start innovating with their games again. For example, Super Mario 3D World was great, but I want to see an HD mario that redefines platforming yet again. Splatoon gives me hope for the future, it's things like that I'd lIke Nintendo to double down on. @BLPs I guess the real goal is just evolution. Whether that means reimagining old concepts or creating new ones, stagnation must be avoided at all costs. They've been pretty good about this so far, but stuff like New Super Mario Bros. has got to go. It was great the first time and okay the second time, but the third and fourth times added absolutely nothing notable and were completely unnecessary. I think the goal should be to constantly be pushing onward, not flounder around and be comfortable pushing out derivative copies. 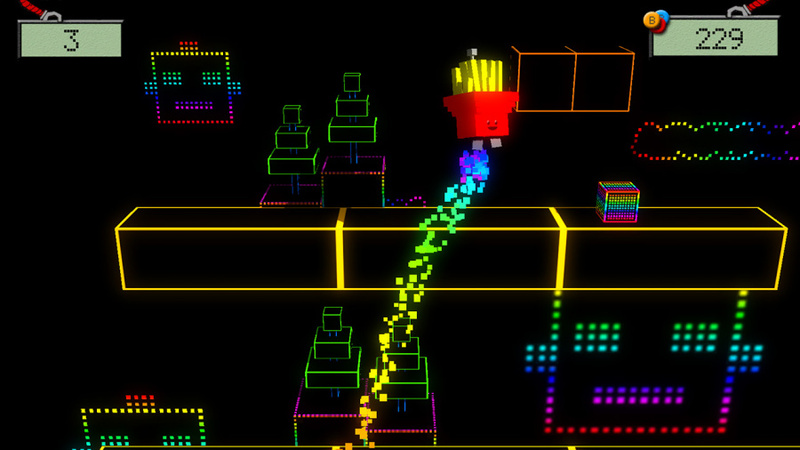 Looks kinda fun, however, I'm not too sure about the MS Paint visuals. I got this game to support Mobot because I liked Paper Monsters. Kind of an impulse purchase at that price. What I don't like of this one and it is not mentioned in the review, is that the camera lags behind you a little, so it takes a few seconds for it to catch up, which leads to many deaths because the screen has not scrolled (or not fast enough) for you to see some enemies. 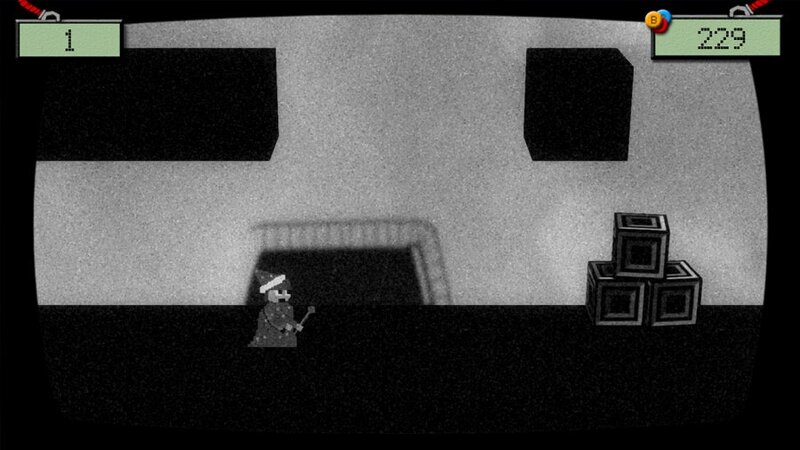 Oh, and I also hate that stupid fly of Spikey Walls being a cameo here. Runner 2 is by far the superior game, and this is easily reflected in the price tag. The music alone makes Runner 2 the winner here. And of course it is more complex, gives you more to do, etc. I'm not a big fan of score-chasing games, and especially not on my home consoles. I might have given this a try on 3DS, but I just don't see it getting much playtime on my Wii U. This game looks pretty fun! I'll check it out on the eShop later. This looks cute. The Gameboy theme makes me want to give this a try... But it really seems like something I'd want on my 3DS, not my Wii U. @Kirby_Fan_DL3 I hear you. I don't like how everything is being simplified either, and I'm also not so into a lot of Wii U games. Call me a jerk, but this trend of naming everything like Flappy Bird makes me want to ignore a game no matter how good it is. It's like, get an original idea and stop trying to capitalize on an already-popular game. @BLPs I agree with you, I feel like most AAA games are content to just push out last year's game with a new number. And the reason I'm such a fan of Nintendo is because they're not as afraid as others to stirke out and try something completely new. However, I don't think there can ever be too much new. New experiences are what keeps things interesting. Kid Icarus: Uprising still stands as my favorite game of all time, simply because of how refreshingly original it was. Not only was the gameplay polished and high-quality, but I'd never played anything like it. I didn't even know that I wanted that game prior to buying it and that's what I'm talking about. I think there are things that we all want to see out of games that we just don't realize because nothing has ever tried it. I posted a high score of 254 just two days after this game launched and it is still currently #1 on miiverse. Come at me, bots. @sinalefa Is this the same developer that did Paper Monsters? I'll pass. I found soooooo many problems with that game that it made me borderline angry. @sinalefa That's flies name is Humphrey my good sir. Is Runner 2 music even that good. The chip tune in this game is great. @DerpSandwich There's no point to start debate like this about this game because that's not the case. And that's not just for you I mean everyone here. @MitchVogel Another thing about that game was the original music. A lot of games here lately are getting remixed music constantly. Not only was the game music original it was great. I find that easier over complexity always wins. These games that use every button on a controller really drag down the experience. Now games like street Fighter uses every button but the controls are simplistic. @Kirby_Fan_DL3 What does Nintendo have to do with this game? This isn't part of Nintendo's approach to gaming. It's a game by an entirely different company. Nintendo had zero input on teh design. They just allowed for the game to appear on their console. @Hero-of-WiiU It's cool if you think the name thing is off-topic, but what do you mean that's not the case? Because it totally is. @KeeperBvK The article was saying stuff about simplicity in games, and I was just remarking at that part. @Inkling I found this in European eShop with release date of 23th of July 2015. I was considering this one since it's on sale for half price now, but then I watched the eShop trailer. They're trying to be funny or something, but it's just so lame that it makes me sad.